LAS VEGAS. WBA welterweight champion Sen. Manny Pacquiao had a running nose when he fought Adrien Broner at the MGM Grand Garden Arena here Saturday night (yesterday morning, Manila) but it was the challenger who did most of the running in losing a unanimous 12-round decision. Right before the start of the fight, Pacquiao blew his nose on a handkerchief held by Gov. Chavit Singson. Throughout the bout, the champion had difficulty breathing not because of Broner’s punches but because of the cold he has nursed for a few days. In the locker room after the match, Pacquiao again blew his nose to clear the congestion. Perhaps, an ordinary athlete would’ve felt the effects of a cold on the field of competition. But not Pacquiao. Strength and conditioning coach Justin Fortune checked with Dr. Margaret Goodman, president of VADA (Voluntary Anti-Doping Association) what Pacquiao could take for his cold and was told to check the VADA website listing prohibited drugs or medicine. Fortune said the list was too long to review. He asked if Pacquiao could take Benadryl with a dosage of 325 mg but never got a reply from VADA. Pacquiao said his goal was to knock out Broner and nearly did it twice during the bout. In the seventh, Broner grimaced after absorbing a left hook to the body and another shot to the midsection almost sent him down. In the ninth, Pacquiao landed a left hook to the head and Broner reeled backwards, losing his balance. A lesser man would’ve been toppled by the impact of the blow. But Broner somehow stayed on his feet the entire route. His durability has never been in question. Before facing Pacquiao, his only three losses were on points. He was decked twice by Marcos Maidana but recovered to go the distance in losing a decision. Against Pacquiao, Broner badly wanted to survive the 12 rounds. It would be less of a stain to lose to Pacquiao on points than by knockout. “I wanted to knock him out,” said Pacquiao. “Buboy told me to relax and not to go for it. He didn’t want me to get careless. He held me back.” Pacquiao said it was a smart strategy to stay away from Broner's counterpunches. Fernandez had good reason to be prudent. In the waning seconds of the sixth round, Broner connected with a counter right straight to the head and Pacquiao was stopped in his tracks momentarily. Fernandez clearly didn’t relish the thought of a repeat of what happened in the Juan Manuel Marquez fight where Pacquiao, closing in for the kill, was nailed with a vicious counter right straight as the sixth round came to a close. Pacquiao was knocked out cold. 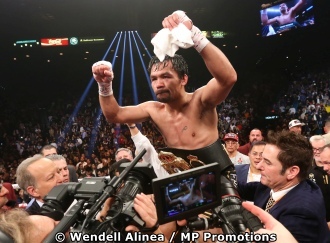 Photo: With handkerchief in hand due to suffering from a cold, Manny Pacquiao celebrates after defeating Adrien Broner Saturday night in Las Vegas. Photo by Wendell Alinea.